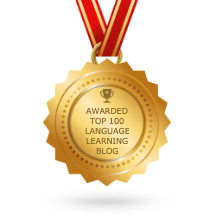 Almost a year ago, COERLL launched the Language OER Network, a website that features teachers, students, and staff who are using, creating, and promoting OER. Featured educators receive a badge and are listed on the website under different categories of work: OER Teacher, OER Creator, OER Reviewer, and OER Ambassador. The lists of featured people are growing in every category except one: OER Reviewer. We encourage teachers to review the free materials they access online, especially if those materials are open educational resources (OER). (We define OER here as any material for teaching and learning that has an open license.) Since OER are self-published, people who use them don’t always know how or if they were reviewed. There is not always a guarantee OER will be high quality. Many authors of open materials take great care in having their materials vetted: they may work on teams, ask colleagues to proofread, go through a formal review process, or test the materials many times with students before publication. However, not everyone has the time or resources to go through this process. This is where peers can be very helpful in reviewing each others’ content after it has been published. OER repositories like MERLOT and OER Commons, or even other platforms for sharing copyrighted materials like Teachers Pay Teachers, offer ways to review materials. Often, a user can give a star rating and write a comment. Other platforms have a more involved and formal peer review process. For example, the Open Textbook Library at the University of Minnesota has faculty review open textbooks based on a specified set of criteria, resulting in a comprehensive, multi-paragraph review. ideally, encourage teachers to talk to each other about ideas for teaching and to participate in a community. If you have used open Creative Commons licensed materials in your teaching (including COERLL’s materials), please consider reviewing them. You can write a review in any public form: a repository like MERLOT or OER Commons (other repositories are listed here), a blog post, or anywhere else you can think of. We recommend that rather than simply rating an OER with a number of stars and giving a generic response like “great activity”, teachers write a little bit about how they used the materials, how the students reacted, and what specific features worked or did not work. 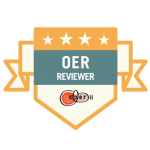 Once you have written a review in a public forum, you can apply to receive an OER Reviewer badge from COERLL.